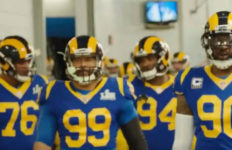 The Los Angeles Rams will face the Atlanta Falcons in an NFC wild card round game Saturday evening, the first NFL playoff game at the Los Angeles Memorial Coliseum since 1994. The NFC West champion Rams finished the regular season 11-5, their best record since 2003 when they were based in St. Louis. The Rams are the No. 3 seed in the NFC playoffs. Atlanta is seeded sixth with a 10-6 record and are the NFC’s second wild card team. The Rams will be making their first playoff appearance since the 2004 season, when they defeated the Seattle Seahawks, 27-20, in a wild card round game, then lost to Atlanta, 47-17, in a divisional round game. The Rams’ 31-year-old coach Sean McVay is the youngest coach to guide a team to the playoffs in NFL history. Ray Flaherty previously held the record for guiding the Boston Redskins to the 1936 NFL championship game, then the season’s only playoff game, when he was 33. The Rams led the league in scoring, averaging 29.9 points per game. The Falcons were 15th, averaging 22.1 points. The Rams defense was 12th in the league, allowing 20.6 points per game. Atlanta was eighth, allowing 19.7. In the most recent meeting between the teams, the Rams lost to Falcons, 42-14, on Dec. 11, 2016. Jeff Fisher was fired as their coach the next day. If the Rams defeat Atlanta, they would play the NFC North champion Minnesota Vikings in a divisional round game Jan. 14 in Minneapolis. The then-Los Angeles Raiders defeated the Denver Broncos, 42-24, in an AFC wild card round playoff game on Jan. 9, 1994, the most recent NFL playoff game at the Los Angeles Memorial Coliseum before Saturday evening. Three former Rams who are members of the Pro Football Hall of Fame — Eric Dickerson, Tom Mack and Orlando Pace — will join the team captains at midfield to participate in the pregame coin toss. The Coliseum torch will be lit by six members of the 1978 Rams — Frank Corral, Nolan Cromwell, Reggie Doss, Vince Ferragamo, Lawrence McCutcheon and Jackie Slater — part of the last Rams team to play a playoff game at the Coliseum before Saturday. Isaac Bruce, the Rams career receiving leader, will be honored on the field in the end zone. Bruce was among the 15 modern era finalists for the Pro Football Hall of Fame announced Tuesday. Slater, a member of the Pro Football Hall of Fame, will be honored during the first timeout of the second quarter as the alumnus of the game. Bruce, former Rams receiver Torry Holt, Mack and Pace will pose for pictures with fans and sign autographs from 3:30-4:15 p.m. in visit the Vivid Seats Tailgate area. The four players will provide a preview of the game at 3:45 p.m. The national anthem will be sung by actress-singer-songwriter Kelley Jakle, who appeared in the three “Pitch Perfect” movies and is a great- granddaughter of the late Baseball Hall of Fame member Branch Rickey. Snoop Dogg will perform at halftime. National Guard Staff Sgt. Michael Missel of Whittier will be honored during the first quarter. Missel served in two deployments in Iraq and was awarded the Iraqi Campaign Medal, the Global War on Terror Service Medal, the Army Commendation Medal and Combat Action Badge.